Britain's Got Talent is an easy-to-play slot. It is pretty standard for Ash Gaming to use a standard layout. That is, it has five turning wheels, three rows, and 20 pay lines. That clearly has its advantages. 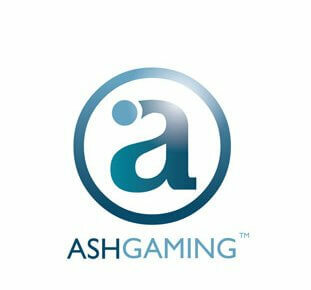 Namely, every player knows exactly what is going to happen when playing an Ash Gaming slot. And, consequently, Britain's Got Talent also has this standard layout and the symbols range from tens to aces. The rest of the animations have to the with the talent show, including the flag, which functions as a wild symbol. The flag can replace any symbol, but the scatter nor the bonus symbol. 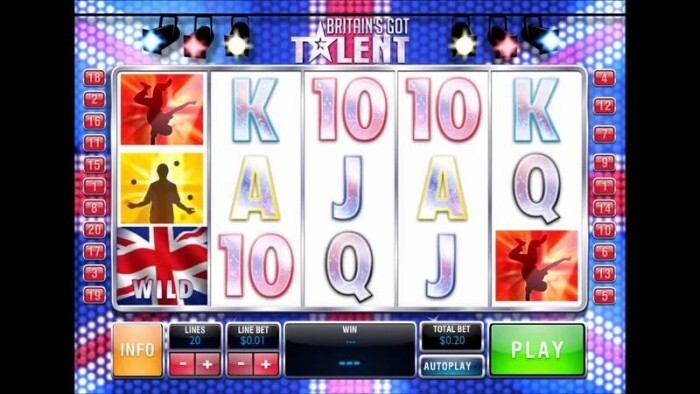 Britain’s Got Talent isn’t just a tv show featuring Simon Cowell, it’s also a slot produced by Ash Gaming. With this, the software producer has tried to get a piece of the tv show’s success. 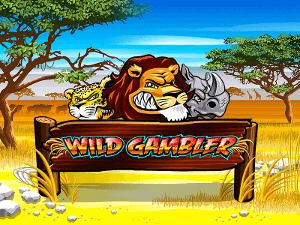 At the moment, quite a few online casinos offer this slot, and it still is an enjoyable video slot with free spins, a bonus game, a wild symbol, and, especially, it’s very clear overview. This is one of those slots you wonder about whether it actually was designed to last. However, the fact that it is still popular, proves that is sure is a lot of fun. How to play Britain’s Got Talent? Britain’s Got Talent is an easy-to-play slot. It is pretty standard for Ash Gaming to use a standard layout. That is, it has five turning wheels, three rows, and 20 pay lines. That clearly has its advantages. Namely, every player knows exactly what is going to happen when playing an Ash Gaming slot. 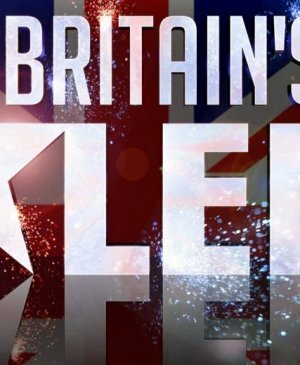 And, consequently, Britain’s Got Talent also has this standard layout and the symbols range from tens to aces. The rest of the animations have to the with the talent show, including the flag, which functions as a wild symbol. The flag can replace any symbol, but the scatter nor the bonus symbol. This bonus game of this slot has a simple layout. You get to choose a backstage pass for a certain act, and then you get the spin the wheel to see what act you’re going to see. With this, the maximum you can win is the value of your wager times 1125. And this is a lot of money! Also, it matters what act you have chosen before. Namely, if your act got a long way on the show, you win a lot of money. However, don’t be frightened, because no matter what happens, you always win a handsome prize when playing a bonus game. On this slot, you can win up to 20 free spins, by getting the scatter. During free spins rounds, you will get random wild symbols on your wheels, which cause your winnings to be a lot bigger than on other slots. Also, during free spins, your wild symbols will stay in their position for the entire time. This means that you can win a lot of rounds on many pay lines! Finally, you can also win extra free spins, during free spins rounds. However, this is less likely during free spins than during regular spins. This slot has 20 pay lines, but you can alter them. However, because free spins are played with fixed wild symbols, it is advisable to play all pay lines and just lower the value of your wager. This can be done in the bottom right corner of your screen. The slot also has an autoplay function, but the maximum number of spins is a meager 25. This is not ideal when you want to just relax while playing. 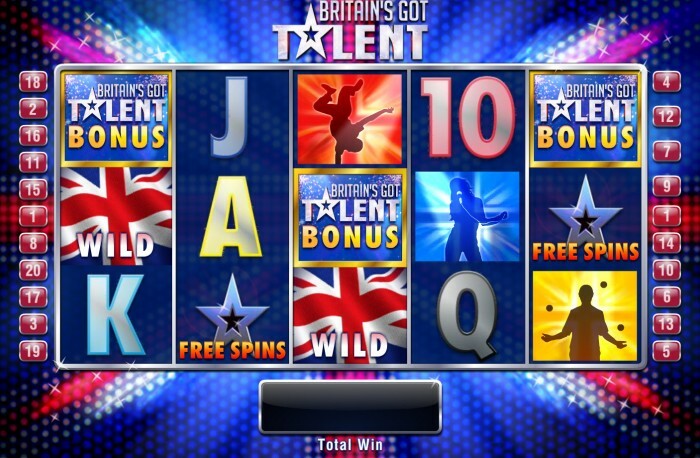 Britain’s Got Talent by Ash Gaming is mainly interesting because of its free spins and the bonus game. It still remains a shame that it does not have a real jackpot, but the multiplier of 1125 times might make up for that at least a fair bit.